Start your own business, become a more valuable employee, provide customer service for your business or organization, earn additional income and get re-commissioned. This intensive seminar which spans 3 days is designed to equip you with everything you need to know to become an effective Notary. 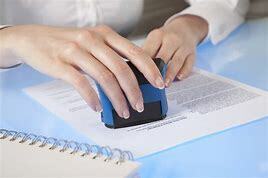 You will find out about new legislation as well as how to pass the official Notary exam (must be taken every 4 years), identify document signers, keep a journal, fill out certificates and avoid lawsuits. The class includes a practice Notary Public Exam. Please read: $35 material fee to be paid to instructor on first day of class. New and Renewing Notaries bring the following: 1) A $40 check made payable to “Secretary of State”; 2) Proper ID – current driver’s license with photo or state issued ID card 3) Two #2 pencils. 4) 2 X 2 passport color photo Live Scan Fingerprints required after you pass the exam. Serious conviction may disqualify applicant. Must be 18yrs.